The OM-CP-LEVEL1000 water level data logger accurately monitors and records water level and temperature. Its rugged, stainless steel design allows for the device to be placed in harsh environments, which makes it well suited for use at waste water treatment facilities, monitoring well and ground water levels, irrigation canals, lake and wetland studies and other water level applications. The integrated vented tube allows the device to be atmospheric pressure compensated, providing improved accuracy and resolution over other, non-vented water level recorders. 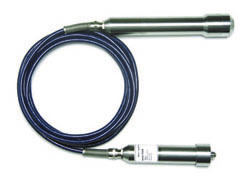 The OM-CP-LEVEL1000 uses a rugged stainless steel pressure strain gauge to accurately measure the water level. Our user-friendly software will display all pressure measurements in the user’s choice of feet, inches, meters, centimeters, millimeters or PSI. The device uses an internal temperature sensor to provide accurate temperature measurements eliminating the need for a separate temperature recorder. The logger can be started to take measurements every two seconds for rapid changes in water level, up to one reading every twelve hours. The OM-CP-LEVEL1000 data logger has the ability to record up to 16,383 readings and store it in its non-volatile memory. Its small size allows it to fit almost anywhere. Data retrieval is simple. Plug it into an empty COM port and the easy to use Windows software does the rest. The software converts your PC into a real time strip chart recorder. Data can be printed in graphical or tabular format and can also be exported to a text or Microsoft Excel. Desiccant: Indicating silica gel inside communications end cap with viewing windows (blue = dry; pink = saturated). Nota: Data logger is supplied with 30' long electrical interface cable/atmospheric pressure compensation tubing assembly. Contact Omega for other lengths. Operator's manual and RS-232 cable are included with the OM-CP-IFC110 Windows software (software is required to operate the data logger and is sold separately). NIST calibration for temperature only.